Outdoor cat house. Do you have a use for one? 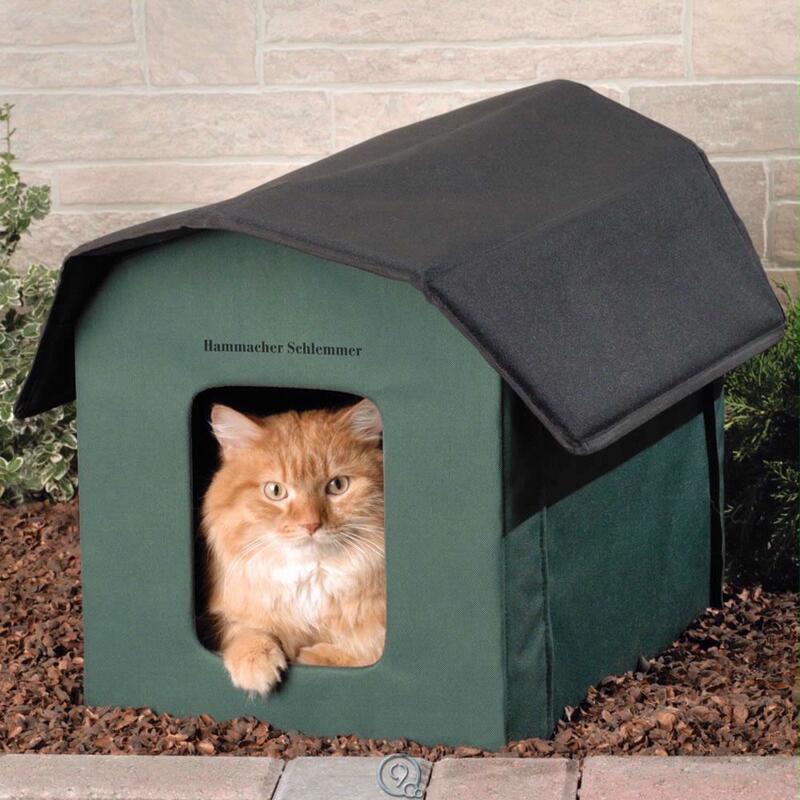 Do you have a use for an outdoor cat house? I know a person who does. Dorothy Wandruff (DW), a regular contributor to this site, lives in sunny California. She uses outdoor cat houses for cats she cares for, which prompted me to ask questions because it is unusual. California produces half of the fresh fruit in the USA. This says something about the climate, which is more inclined to outdoor living. DW comments on her cat housing arrangement below her photographs…. I am attaching photos of the back yard cat house. One shows with the tarp down, the second shows the little house. The roof raises up completely for easy cleaning inside. 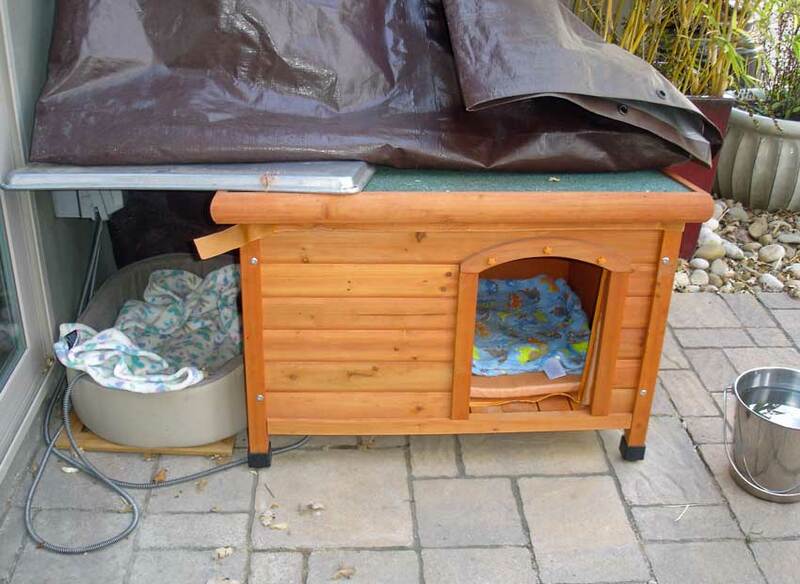 The little bed on the side is for when they prefer to be outdoors ( comment: I presume this means without the roof). The two bed photos I sent…are Shadow and Yellow’s beds. They sometimes sleep together in either one, and sometimes separately. Yellow used to spend time on the brick next to the house, which is why I put another bed there. Now that Shadow is here every night, they use them both. Both are heated. Shadow and Yellow are ‘lovers’. Such a sight to behold. Together all day. They have separate heated beds. But always sleep together in the same one. Sometimes in the little house I set up for them. Sometimes on the one outside of the house. They lounge in the yard together, chase things together, frolicking and playful. Only eat together. I think Shadow assumes the property belongs to her, as he lets her chose which bowl and doesn’t start eating until she does. She is blond as ever, almost white. He is jet black with yellow eyes. They are something else. Truth be known, Shadow, Yellow’s companion and best friend, is not my cat. He belongs to the next door neighbor who has two kids and two dogs. Sometimes three dogs. They know he lives here. He makes token visits to his other home. But he lives here, on my property, with Yellow. They know it, and being, I guess, a modern busy family, they have never said they prefer I stop feeding Shadow. In fact, if I leave over night, the man of that house feeds my outside cats in the early morning. I give instructions for Shadow and Yellow’s meal, and for Marvin. Separate parts of the property of course. When the neighbors are gone for days, we feed their dogs. And chickens. I really had no choice. Once Yellow invited Shadow to the feeding trough, there had to be enough for two. So it has been now for years. 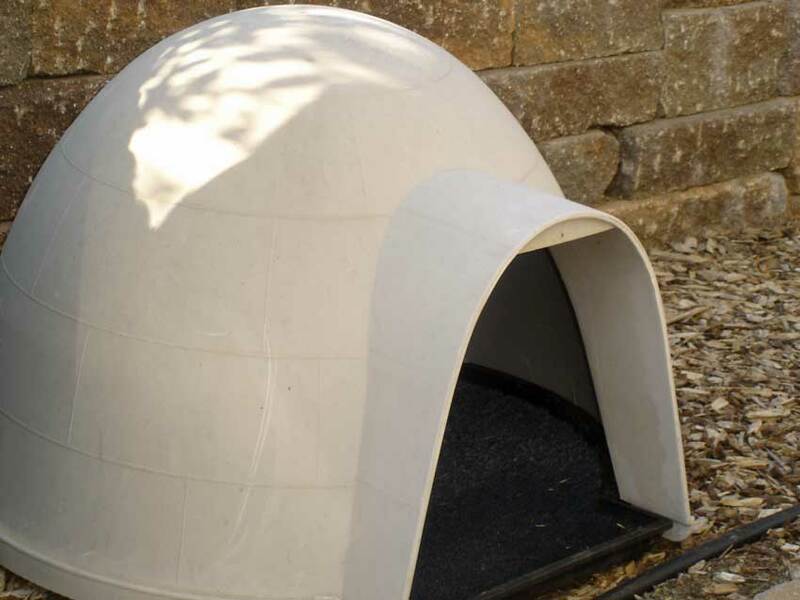 I have also added the Igloo that has essentially been ignored by all the cats. I plan to put it up in the highest part of the garden, and maybe someone will actually use it for shade, or whatever. It never worked for any of the four cats. His [Marvin’s] sleeping quarters are in the front of the house. The three still don’t get along. He is territorial, king of the manor. It is unusual for domestic cats to sleep outside but DW’s cats are not typical domestic cats. Yellow is a true feral cat that DW befriended. Yellow has never become domesticated in the way people like and DW respects Yellow’s preferences. 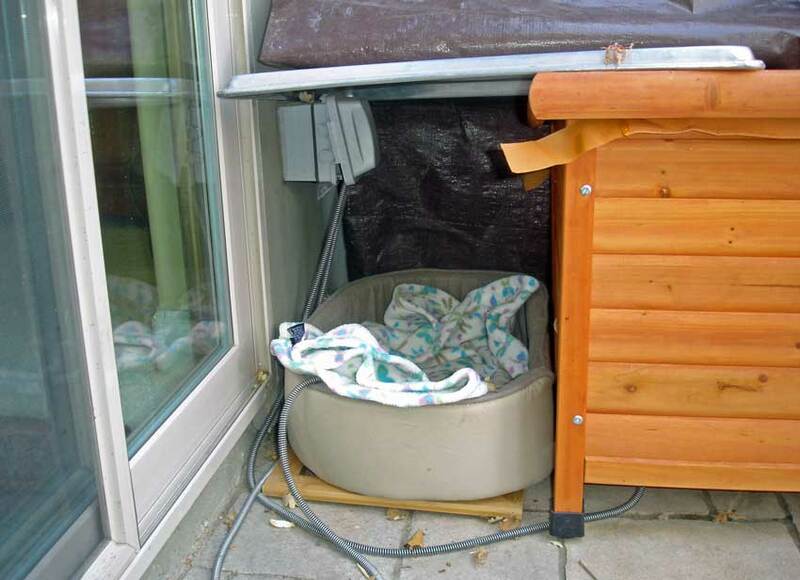 Setting up an outdoor cat house is an example of how a person can provide care for a feral/domestic cat while respecting the cat’s character. Marvin is much more domesticated. Is it fair to state that Marvin is a stray that has found a loving home with Dorothy? As for Shadow, DW simply accommodates him. I think what is good is that DW respects her cats. She accommodates their preferences and does not force her desires upon them. That is what I have called acceptance and it is the mark of excellent cat caretaking as far as I am concerned. This entry was posted in ailurophile, Cat Products, cat welfare, Feral Cats, Human to cat relationship, Moggie, outdoor cat house, Stray Cats and tagged cat products, Dorothy Wandruff, feral cat, outdoor cat house by Michael Broad. Bookmark the permalink. Here’s the “heated cat house” image. My cat, Mitzy, has started meowing loudly at the door to go out, and I feel badly, but I can’t let her out because of rules, and won’t let her out because of safety concerns. She has a fenced porch where she watches birds, and has been fine with that for over 2 years, but now it’s not enough. So, I’ve been on a search to find a diversion to take her focus off the door. I pick her up and play with her, or get her favorite bird on a string, but it only works in the moment till next time. I have roommates, so I’ve put up a sign to watch for her when entering or exiting. I may try a frozen mouse, to see if that helps satisfy her hunting desire. In the meantime, I started looking on EBay for new toys, although she has a lot already. I saw a “tunnel” that she might like to hide in to watch the birds. Now, she hides under a rug on the porch. She sometimes sleeps under it for hours! The first time she did that I thought she had escaped, and was in a panic for quite awhile. I saw a “cat house” that I really like. I’m thinking of it for a feral I feed. 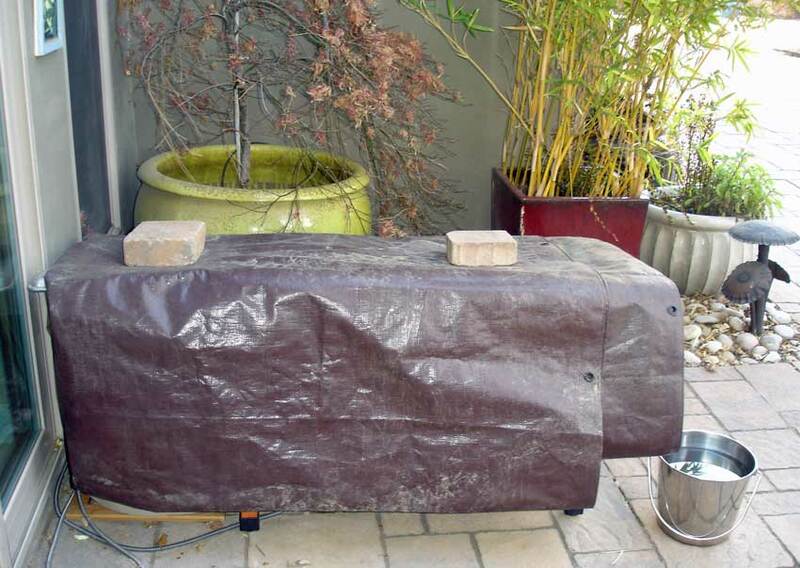 Some people use styrofoam coolers, and other home made houses which are quite ingenious. I live in Northern California, and it can get chilly in the winter, and even now in April. We have very cool foggy mornings, and clear hot afternoons. I like the way this house is heated, so it’s not dangerous, and have included a picture. Has anyone seen or used this? The other item I’m considering is called a “FunRun”, which I’m also including a picture of. It would keep her safe, but I have a feeling that she would still cry to get out. I had purchased a large cage for her at another house, and she cried the whole time she was in it. So, it’s not just being out, she wants to be free to “run” around. If I do get it, and it doesn’t work for her, I’d have to sell it. Maybe it would work better for a small dog? 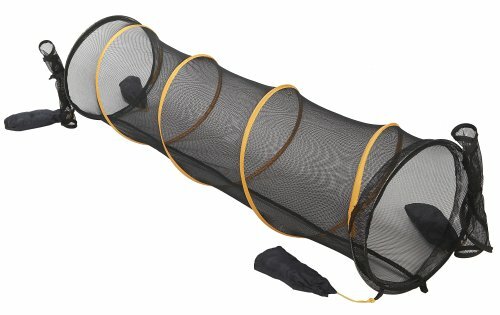 Any thoughts on this for a cat? I’m hoping both of these images get posted here. If not, I’ll re-post separately. How I admire you both Dorothy and Dee, not only for caring for cats and worrying about them sleeping outside when it’s cold, but for understanding that they are happier doing that. Those outdoor houses are wonderful! Me too Ruth. I love the way DW has accommodated the cats’ desires and wishes and not forced the standard domestic cat setup on them. Well, ofcourse. Just because DW lives in CA and I live in Fl doesn’t mean that temperatures don’t really dip sometimes. Tonight, it will be 37 degrees F.
DW has some very good shelters. I have 4 on my deck alone. One is wooden about 4 feet by 2 feet that accomodate up to 12-15 cats. The other 3 are converted very large dog carriers that will accomodate 4-5 cats each. They are insulated with mylan, have indoor/outdoor heat pads. and are tarped. I hardly sleep at all on nights like these and will check and recheck these. And, if the temp should drop to the teens (rare), I won’t sleep at all. I have several space heaters to put at the openings and blow heat inside. They have to be quiet ones so they don’t spook the cats; but, I have to be awake and alert to use them, because there is a safety issue. In my colonies, the best I could do was to make pile after pile of straw big enough for them to crawl into. I think I love you Dee. Thank goodness the are people like you. Well, us. I am grateful there are not huge colony’s of feral cats here anymore. I would make it a full time job. I know about those sleepless nights. Yellow takes off maybe twice a year, for sometimes three days. I have camped out by the back door keeping watch. She is so small. I forget how wonderfully powerful she really is. I imagine she gets sick, and goes off to take care of it. I only hope that when her time comes, she will chose to die in the yard. Save me the long sad search. But I digress! They are wonderful critters. So capable. I certainly need them more than they need me! Merry Christmas to you Marc. Be well and hurry home, but have fun along the way. Odd for a girl to take off like that. But, ya’ know, sometimes these guys just get on our nerves and we have to go! That is funny Michael, about California being the salad bowl of the country. It is true. We enjoy lovely weather most of the time. It is more temperate in California than many states, but it does dip down in the teens in the winter here where I live. The cats, like we humans, get cold when the weather changes. Especially after a very hot summer. Their fur grows thick fast in November. But the reality is, given a choice of a heated bed (special pet heating pads with outdoor plugs only) or not, most mornings in winter, I find three full heated cat beds. Full of cats! They know what they want. Thanks for writing the story.